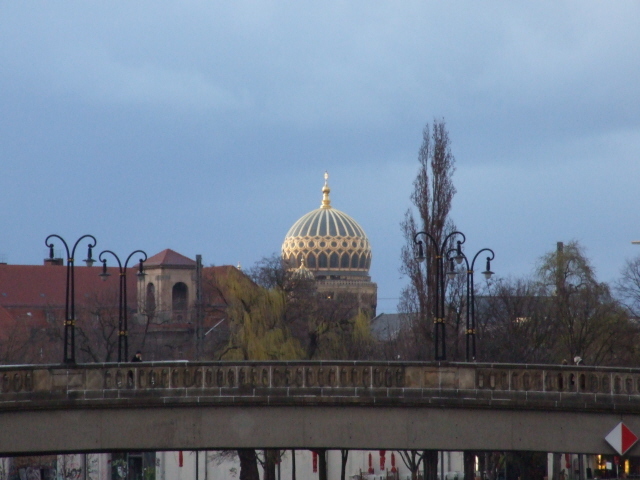 Germany's capital – and from a dark tourism point of view the capital of the planet! Nowhere else can there be found such a wealth and wide range of sights that are of interest to the "dark tourist". Obviously enough, this has to do with the history of the place especially over the last century or so. From Prussian imperial capital, via the Weimar Republic and the following "Third Reich" of the Nazis. And after that it became the central hotspot of the Cold War (if that's not a contradiction). After all, the Berlin Wall also stood as a symbol for the division of the whole of East Germany from the West and even for the entire Western vs. Eastern Bloc conflict! Moreover, Berlin was the capital of the socialist single party regime of the former GDR – as well as the place of its downfall. It was here that the end of the Cold War manifested itself in the most palpable fashion, namely through the "fall of the Berlin Wall". What there is to see: All of those aspects of Berlin's exceptionally rich and varied dark history have left plenty of traces still to be seen today. Some are more visible and rewarding, some less so, but one thing is certain: Berlin has more sites to offer the dark tourist than any other city in the world! Berlin ‘underworlds’ – bunkers, air-raid shelters etc. These are only the major sites – there are plenty more smaller-scale ones, such as memorial plaques marking sites of Nazi terror, or the GDR regime, e.g. Wilhelmstraße or on Karl-Liebknecht-Straße. Or the site of the Old Reich Chancellery, at Wilhelmstraße 77, where Adolf Hitler used to reside from 1933. Behind the building there was the infamous "Führerbunker", the massive underground air-raid-shelter that served as the dictator's final hideout and the place where he eventually committed suicide. Most of that area was destroyed at the end of WWII or shortly after, and given the site's location right at the East-West "Iron Curtain" border no proper archaeological excavations were feasible for 45 years. When it finally became possible, from 1990, it was, however, decided not to make the spot a visitable site for tourists (mainly for fear of unduly attracting neo-Nazi attention). Instead the bunker remains were covered up and sealed – esp. the rediscovered 'drivers' bunker' that apparently still featured Nazi murals. Only a modest information panel marks the spot. There are, however, remains (of sorts) of Hitler's megalomaniacally grandiose New Chancellery's red marble hall: the material was reused in the reconstructed metro station which is now called Mohrenstraße. 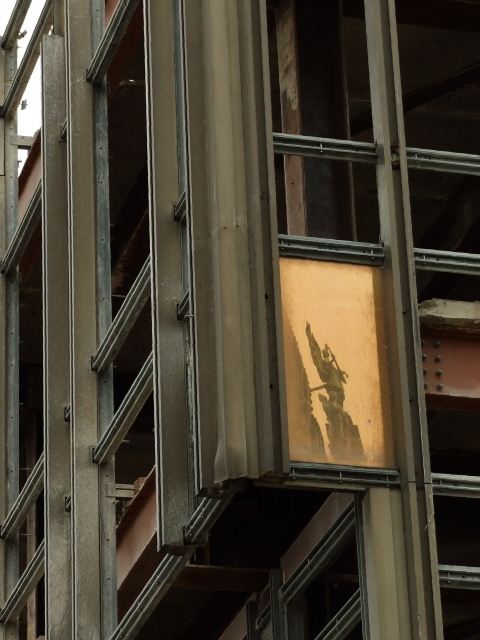 More of the material was used in the construction of part of the Soviet war memorial complex in Treptower Park. 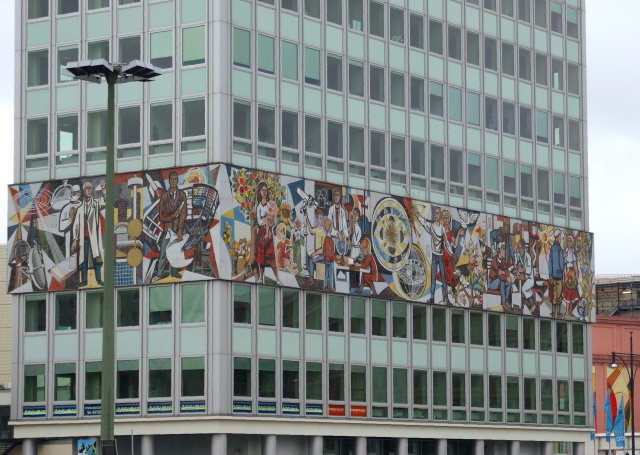 Moreover, moving further on into post-WWII history, there are various relics of East Berlin's GDR past, such as socialist realist murals and old Eastern adverts on buildings e.g. on or near Alexanderplatz. But it remains to be seen how many of these relics will survive. 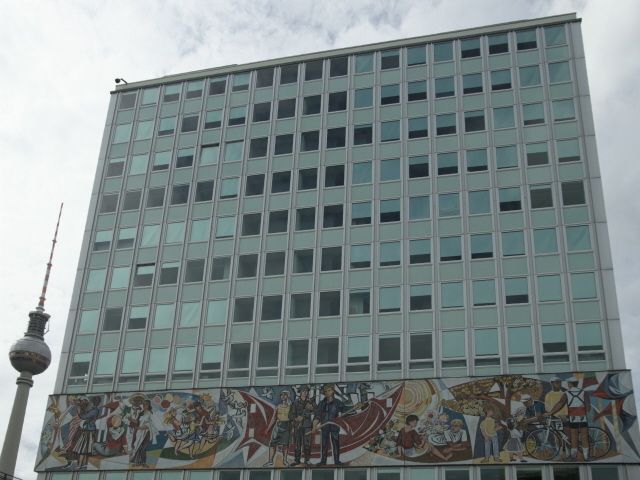 The former "House of Teachers", with its massive mural of "everyday life" in the GDR, located at the north-eastern corner of Alexanderplatz, is one of the more likely candidates for being preserved, while other buildings of the era will probably fall victim to the ongoing massive reconstruction efforts in this central part of the city. The largest continuous stretch of (listed) Stalinist-style socialist architecture in East Berlin is Karl-Marx-Allee. 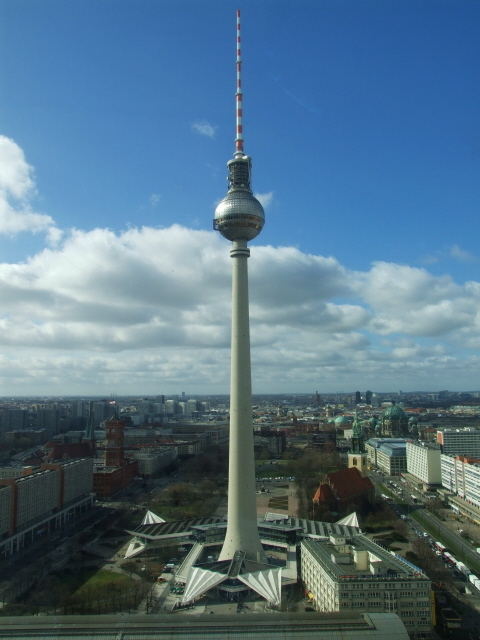 The East's premier landmark, though, the fantastic TV Tower on Alexanderplatz with its spectacular sphere housing the observation deck, is pretty much guaranteed to remain the pinnacle (literally) of all GDR architecture … as it was intended to be, in a rather unabashed kind of propaganda statement. 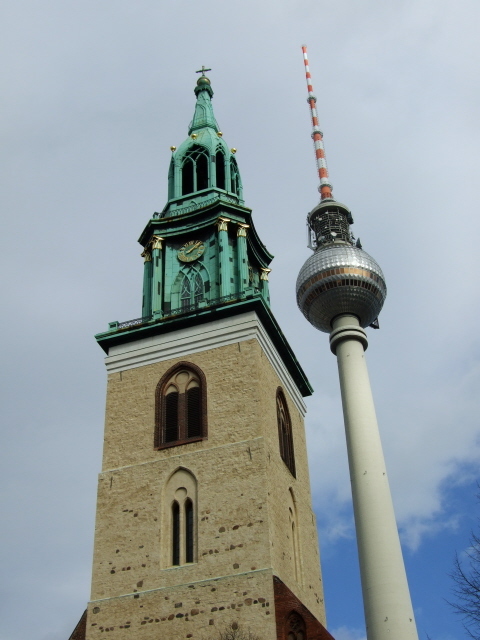 It's thus not without irony that it's still the tallest structure in all of Germany. Already lost, on the other hand, is the former GDR parliament building, the "Palace of the Republic", whose demolition has been surrounded with a good measure of controversy. In its place the reconstruction of the former Stadtschloss (city palace) is currently progressing. I must say that I find this rather dubious … in my view this is revisionist, artificial and superfluous. But so what, if the city wants fake old rather than genuine history, then so be it. Architectural relics of the Nazi era are few, but the former building of Göring's Aviation Ministry is a grand exception ... today housing the finance ministry of the FRG – see also Topography of Terror. 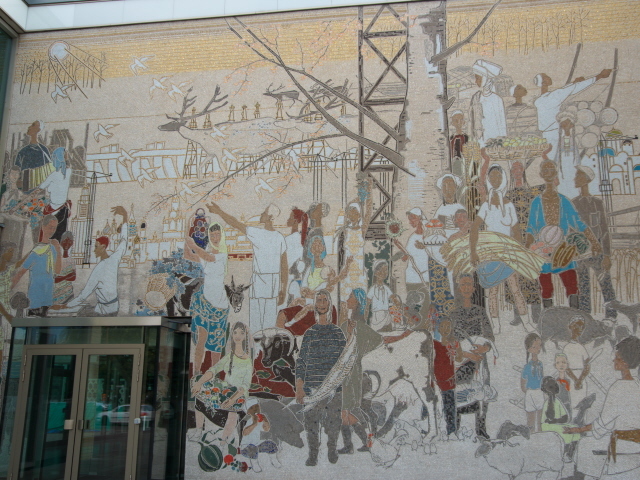 At its north-eastern corner is a square and monument commemorating the uprisings in the GDR of 17 June 1953, while hidden behind the colonnades is another prime example of socialist realism glorification of labour. 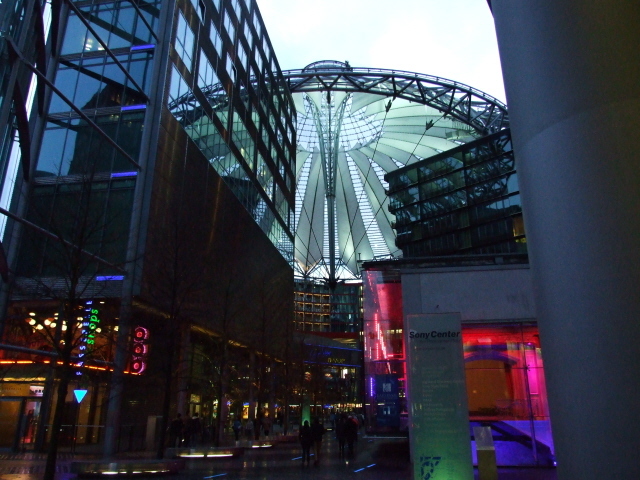 The contemporary architecture of political power is, however, mostly found near the Reichstag and along the banks of the river Spree north of it, while the architectural exuberance of economic powerhouses have sprung up around Potsdamer Platz in particular. Comparatively faded, on the other hand, are the former splendours of Jewish Berlin – with one glorious exception: the New Synagogue on Oranienburger Straße is certainly one of the finest buildings of its sort anywhere in the world. Not far from this, in contrast, can be found the shattered remains of the former Jewish cemetery on Hamburger Straße, in front of which stands a moving deportation monument. Contrasts galore! In addition to those more or less permanent sites of perhaps secondary interest to the dark tourist (compared to the main sites given separate entries), there are frequent special exhibitions that may well be of particular interest from a 'dark tourism' perspective – e.g. the "Mythos Germania" exhibition I saw in 2008, which was about the Nazis' megalomaniacal plans for the reconstruction of Berlin. Its central exhibit, a large architectural model of the reworked city was used as a prop in the film "Der Untergang"/'Downfall', starring Bruno Ganz as an eerily realistic Hitler at the end of his life. 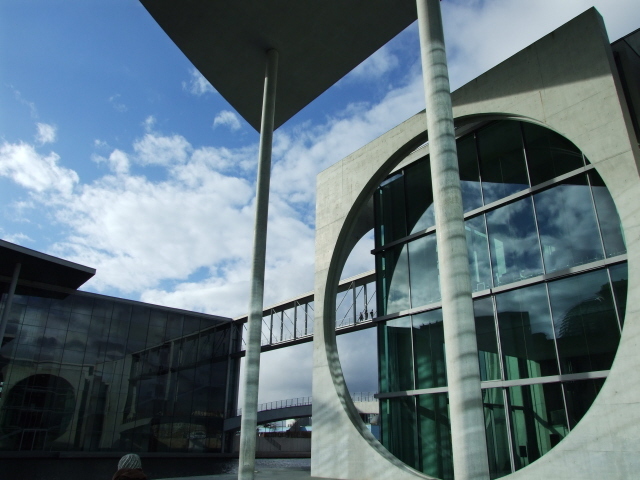 It is in any case more than worthwhile for any Berlin tourist to check out what's on in the area of temporary exhibitions and the like. 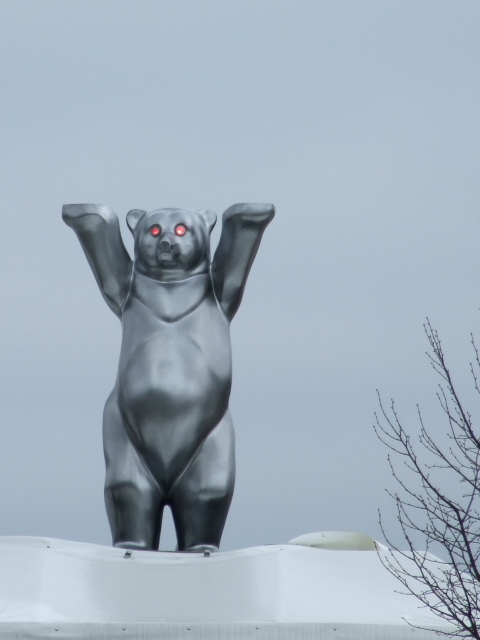 In general, Berlin caters comparatively overtly to a dark tourism clientele (without many people using the term dark tourism, of course), or to all those with an interest in 20th century history in general. Thus most tourist information spots and souvenir stands will have plenty of relevant information material such as books, brochures, etc. on offer. In fact, the range of such material is so vast that it isn't so easy to sift through it and separate the wheat from the chaff. You'll have to be careful and very consciously selective … as there is a lot of crap amongst the decent efforts. A very good place to browse and compare what's on offer is the shop "Berlin Story" on Unter den Linden. If you're not already well equipped with information and reading material, this is possibly the most worthwhile first port of call on any dark tourist's first (or even repeat) visit to Berlin. The enormous range of sites of dark historical significance in Berlin is also reflected in the fact that the book series "PastFinder" has TWO separate volumes on Berlin, one about "Berlin 1933 – 1945" (i.e. the Nazi era) and "Berlin 1945 – 1989" (i.e. the Cold War era of division and communism in the East). Both volumes are recommended for a good overview and some additional background information – they are also suitably portable for having on you when exploring on foot. Location: In the east of Germany, in the middle of the Brandenburg region; roughly 60 km (40 miles) west of the border with Poland. Access and costs: plenty of good transport connections, easy to get around in; relatively affordable for a capital city. Details: Being a capital city and a hub for all kinds of transport, Berlin could hardly be more easily reachable, be it by train, coach, car or plane. There are endless connections to choose from. Most people are likely to go either by train (arriving most probably at the modernized massive central station, Hauptbahnhof, in the Mitte district of the city) – or else by plane, either arriving at the city airport in Tegel or at the constantly expanding Schönefeld airport outside the city's boundaries to the south-east. The old historic city airport at Tempelhof has been closed for good since 2008. Costs can be kept flexible – both for getting there and for accommodation, there's the fullest range of options. Several budget airlines serve Berlin and often offer extremely cheap connections, but there are also decent offers from the more traditional airlines. Accommodation is plentiful in all categories, up to the super luxury of the famed Hotel Adlon. For those interested in the former GDR, there are a few options that deserve special mention in the East of the city, especially the "Ostel" (literally 'Eastel'), which goes the full hog in trying to recreate bygone GDR days in its design (including many original pieces of GDR interior design). There are also a few other places that use converted flats in those typical Eastern pre-fab high-rises ("Plattenbau" in German) for hotel accommodation. And the very biggest of the former GDR's hotels (formerly the Hotel Stadt Berlin) right on the central Alexanderplatz is now part of an international hotel chain. And those in search of something extra special could check into the extraordinary Propeller Island City Lodge where each room is an individually designed, live-in work of art. Rooms include psychedelic designs such as one that is upside-down (i.e. "furniture" is hanging from the ceiling), a padded cell, a completely mirrored "kaleidoscope" room, a prison-cell-like room and, for the really darkly minded: a "crypt", where you can sleep Dracula-style in coffins! Food & drink can be remarkably affordable for a capital city of this calibre. Of course, you can spend loads in overpriced gourmet temples, but Berlin's extremely wide range of ethnic restaurants can make for delightful culinary explorations for relatively little money – some are real bargains, without compromising on quality. In fact it is in Berlin that I have eaten in more restaurants where the food was both superb and really cheap at the same time than anywhere else in the world (at least within the First World, that is). Much of the sightseeing does not eat (much) into the traveller's budget either. Many of the places to visit that are listed here are free (the relics of the Berlin Wall, for instance). Others charge more or less normal prices, a couple are excellent value for money (e.g. the guided tours of the former Hohenschönhausen prison for the GDR's political prisoners). Time required: do not underestimate the size of this sprawling city, nor the sheer number of things to see. Moreover, some of the most significant dark tourist destinations require covering huge distances, so expect long journeys by public transport (e.g. to Sachsenhausen, Hohenschönhausen, House of the Wannsee Conference). As a rule of thumb I recommend: better double your initial estimate – good as the public transport system may generally be in Berlin, the connections are not always all that frequent, so that in addition to long journey times you will also have to factor in some lengthy waits on train platforms or at bus stops. If you want to see everything, or at least most of what's listed here, you should allow at least two whole weeks! 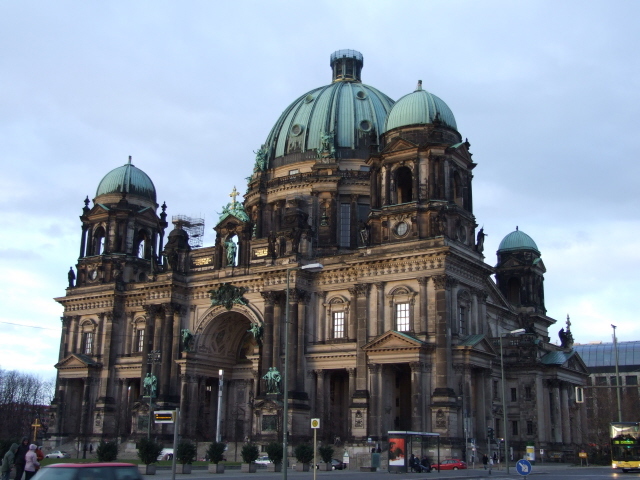 If you also want to take advantage of some of Berlin's many other attractions you'll need even more time. A mere weekend city break will only allow you to just about scratch the surface – or will require some radical prioritizing. The sheer range of sites to see can lead to sightseeing-overload – so ideally one should explore Berlin in stages and over the course of a few return visits, if possible. Combinations with other dark destinations: Apart from the many sites within Berlin, or just outside but easily reachable by means of the city's extensive public transport system (esp. Sachsenhausen and Potsdam), there are a few other dark destinations within the relative vicinity of Berlin, e.g. the Ravensbrück former concentration camp, or the lignite strip-mining moonscapes in the Lausitz area towards the Polish border south-east of Berlin. If you're doing a "dark" round trip of Germany, this obviously has to include Berlin. The proximity of Poland also makes for good combinability with sites in that country. Combinations with non-dark destinations: Berlin is well worth a visit for all its other non-dark, cultural, architectural, even culinary attractions. There's an overwhelming range to choose from, which to list exhaustively would go way beyond the scope of this website – so I suggest you refer to standard guidebooks and/or the Internet where you'll find more than enough information. And no round trip of Germany would be complete without Berlin anyway.